Guys, I'm so excited about this post. 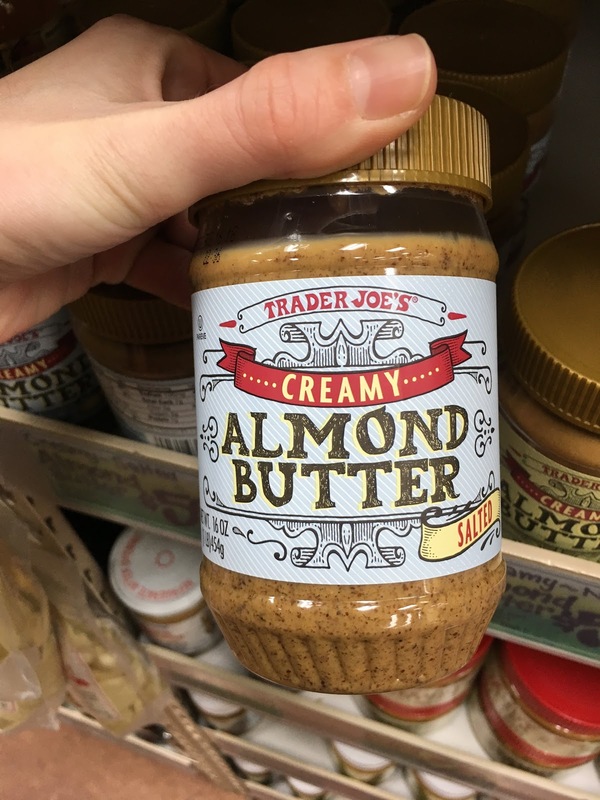 Like pretty much all other humans with souls, I love Trader Joe's. Love. 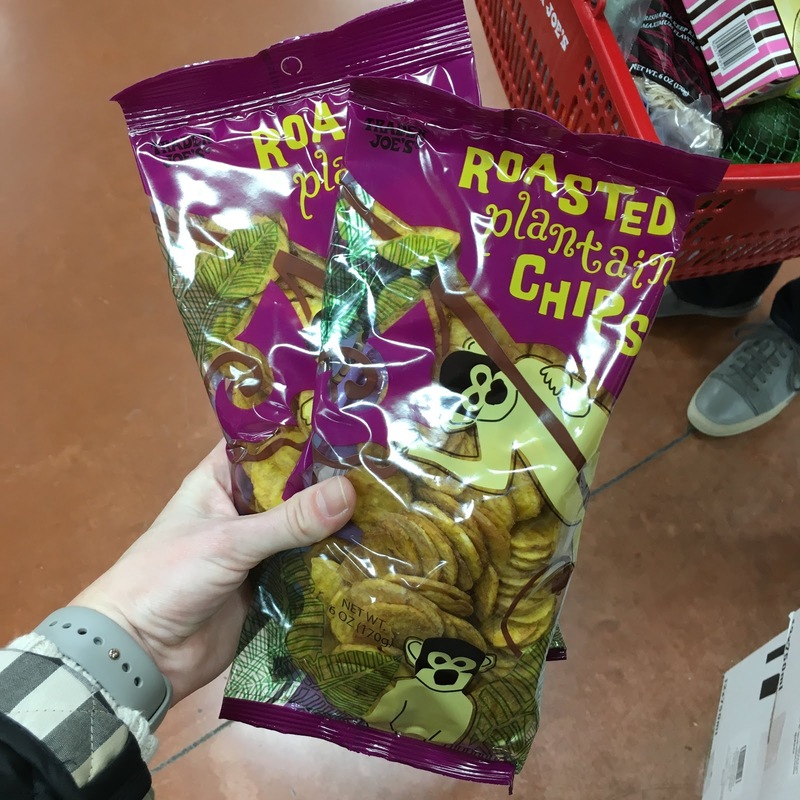 When we were strategizing our Bloomington exit, I had a few criteria for our elusive destination city; I required that it have a Trader Joes, Nordstrom, and airport. No, but really. 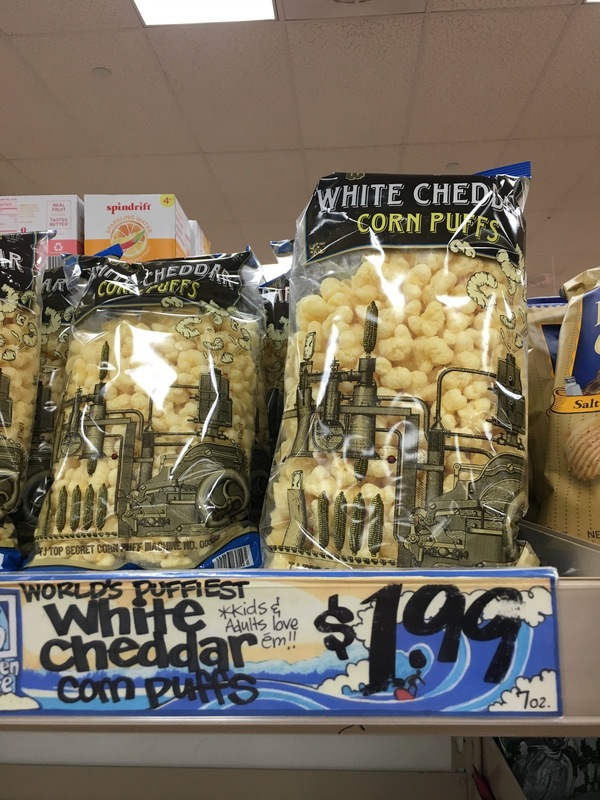 So when I polled Instragram a few days back and the response was overwhelming in favor of a Trader Joe's favorites post, I got down to business. First I created a list, which ended up being easily 1/3 of the entire store. So I had to edit the list, then edit a little more, then go on a field trip to photograph all my favorites. It was an endeavor of love. So, read on for my favorites, and please share yours in the comments! 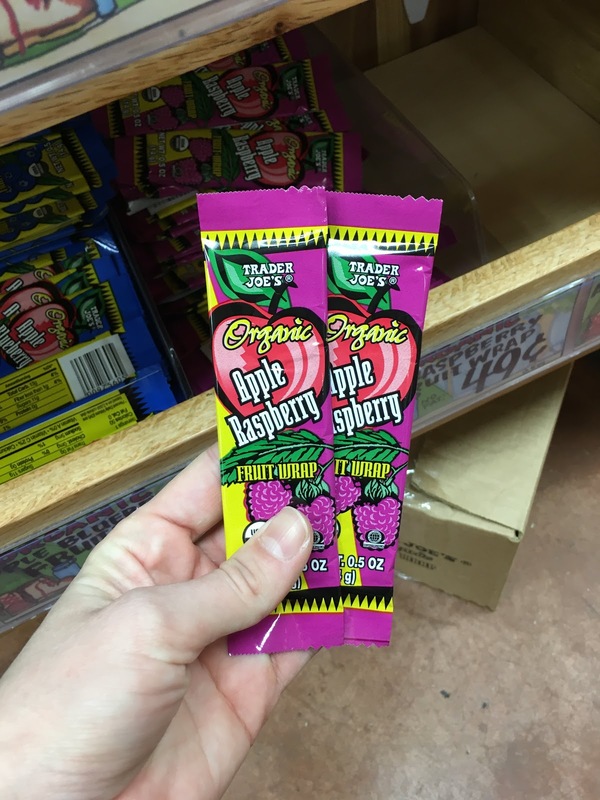 Nothing makes me happier than adding to my Trader Joe's shopping list. Almond butter | This stuff has a bit less viscosity than peanut butter, but the flavor is just so good. I use it with apples, or drizzled over a baked sweet potato with flaked coconut for breakfast. 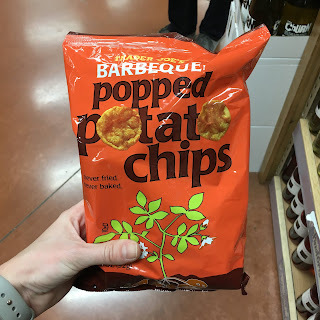 Sounds weird, but trust me it's delicious! 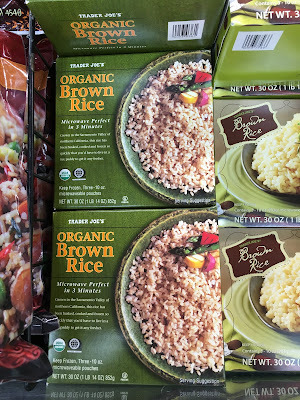 Organic frozen riced cauliflower | This was sold out on my field trip unfortunately, but trust me it's worth checking back. 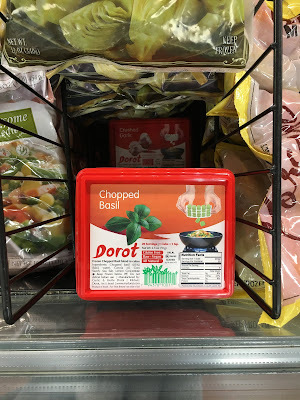 I use it in burrito bowls, to make fried 'rice', as the base for stir fries, and to bulk up chili. At any given time, I have at least 3 bags in my freezer. 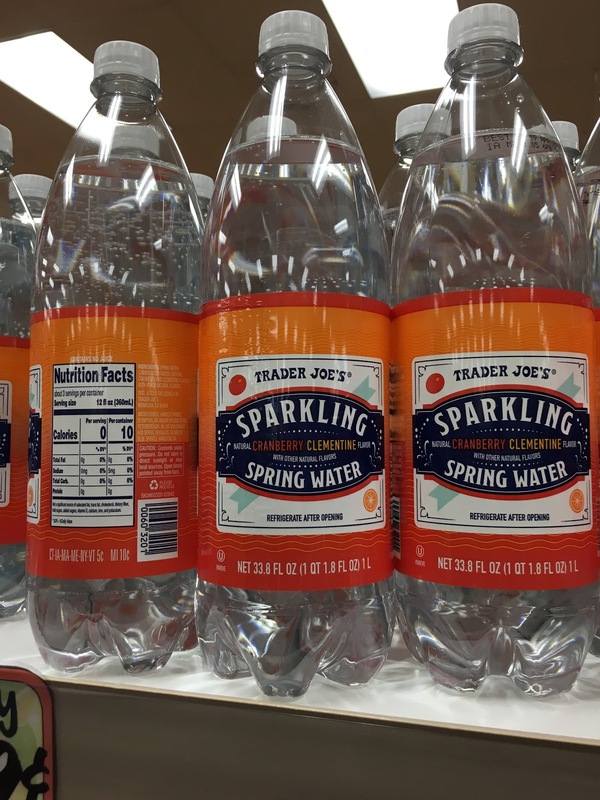 Also worth noting how insanely cheap TJ's version is compared to the conventional grocery. Chomps beef snack sticks | I love these. 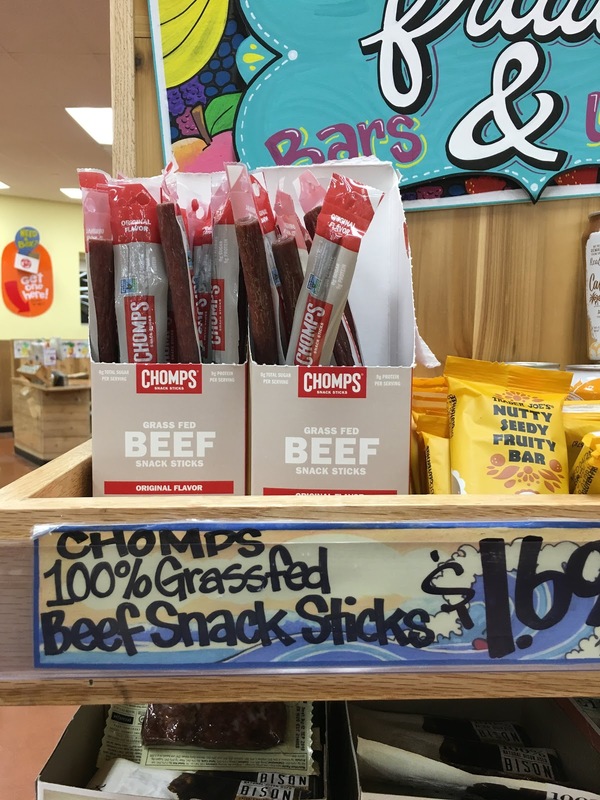 They're basically a grass-fed, clean ingredient Slim Jim, but so much better. 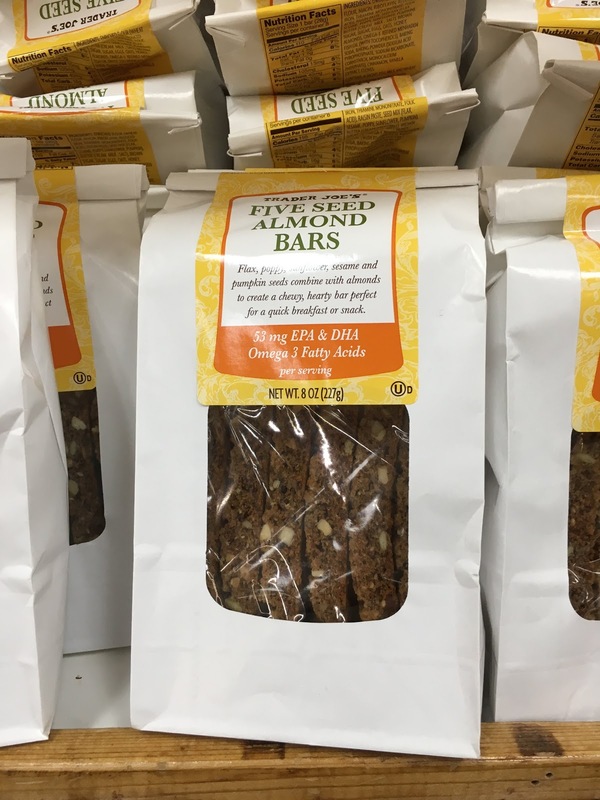 They make great snacks, or serve as a good protein addition to any meal. They're not spicy, just savory. 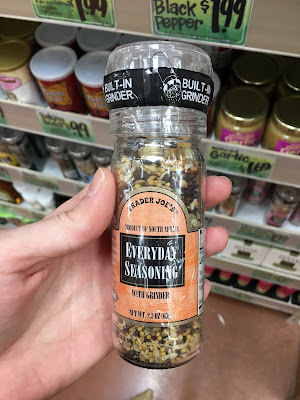 Everyday seasoning | This is my go-to lazy seasoning. It's super delicious on chicken breast, and harmonizes well with basically any flavor profile I use it with. For $1.99, it's a no-brainer. 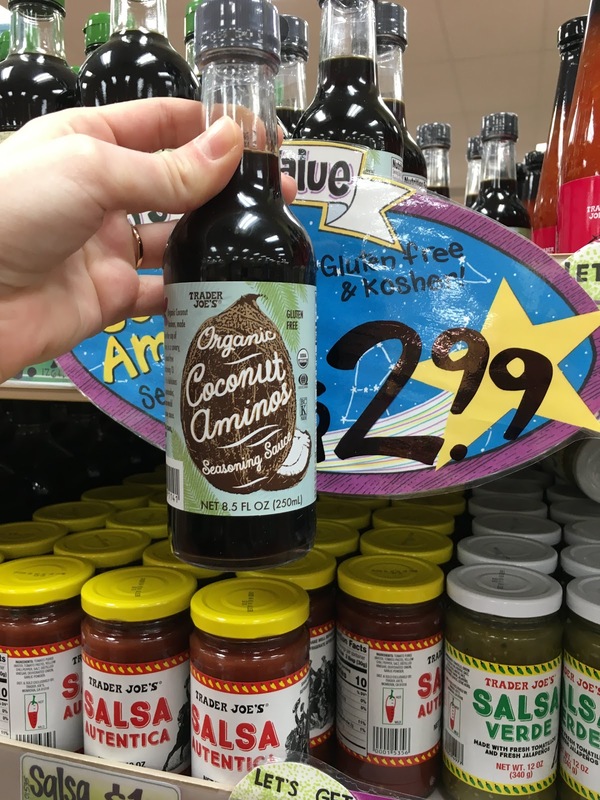 Organic coconut aminos | Basically soy sauce without soy. Plus this stuff is usually like $6 at the grocery store, so you can't beat the price at TJs. 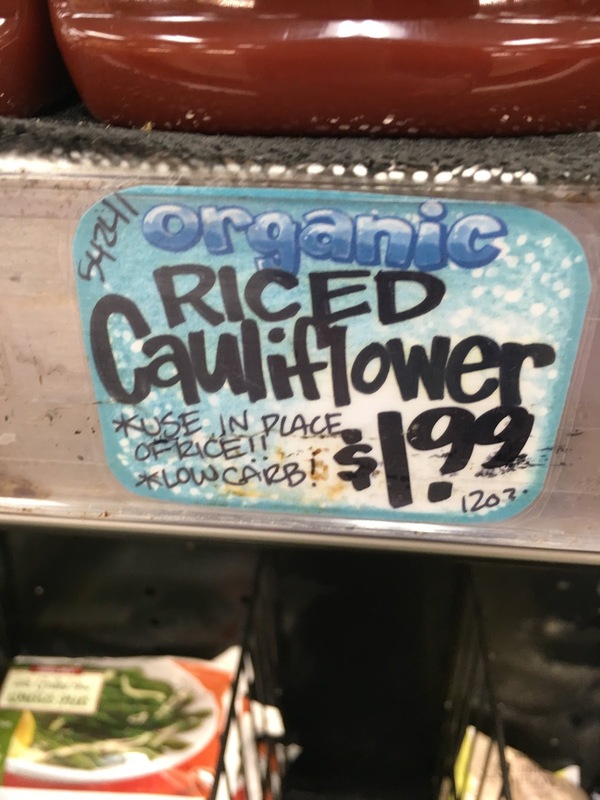 I primarily use it for fried cauliflower rice and stir fries. Fruit wrap | So, I use these as emergency pick me ups on Whole 30. Yes, they miiight violate the spirit of the program, but the ingredients are clean and they're delicious. 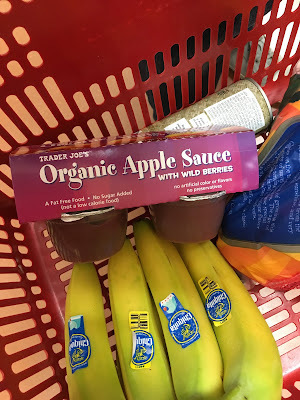 Organic wild berry applesauce | I've always loved applesauce, and the wild berry gives it a little something extra without adding sugar. Winning. 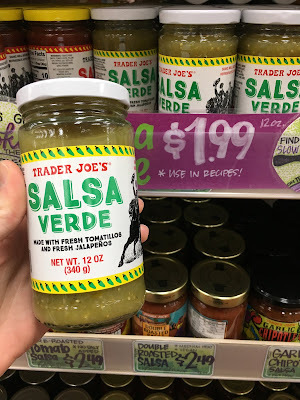 Salsa verde | This stuff is SO good. A little tangy, a tiny bit of heat. 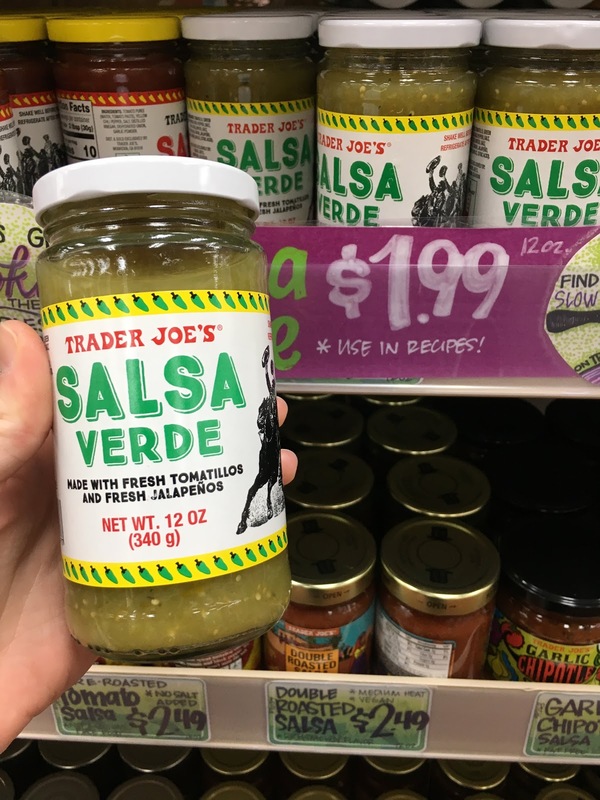 It's delicious with tortilla chips, but my primary reason for buying it is to throw in the crock pot with a few chicken breasts for the easiest and yummiest shredded chicken tacos or burrito bowls. If you're feeling fancy you can add some cumin and then stir in some fresh cilantro at the end. 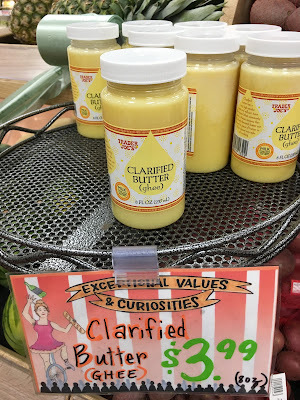 Ghee | This stuff is a Whole 30 necessity. 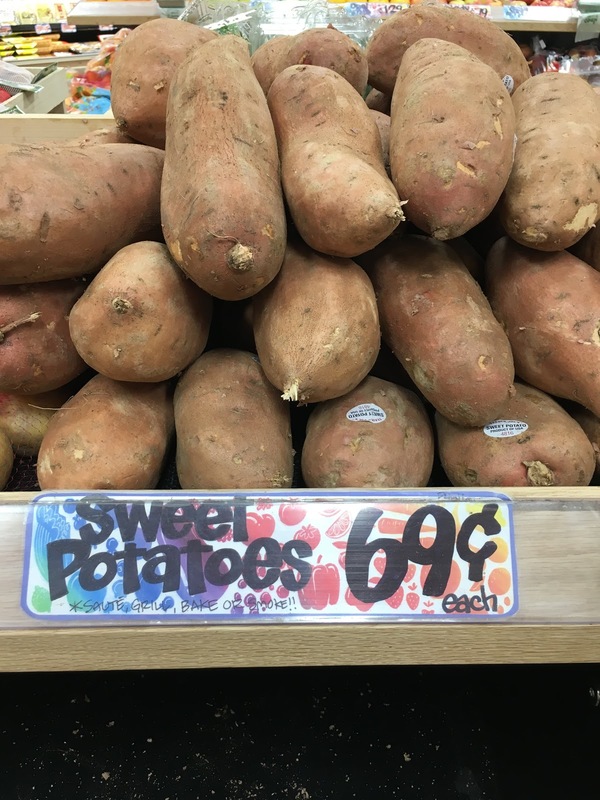 Really, I just require it for mashed potatoes, but that alone earns it a slot in my pantry. 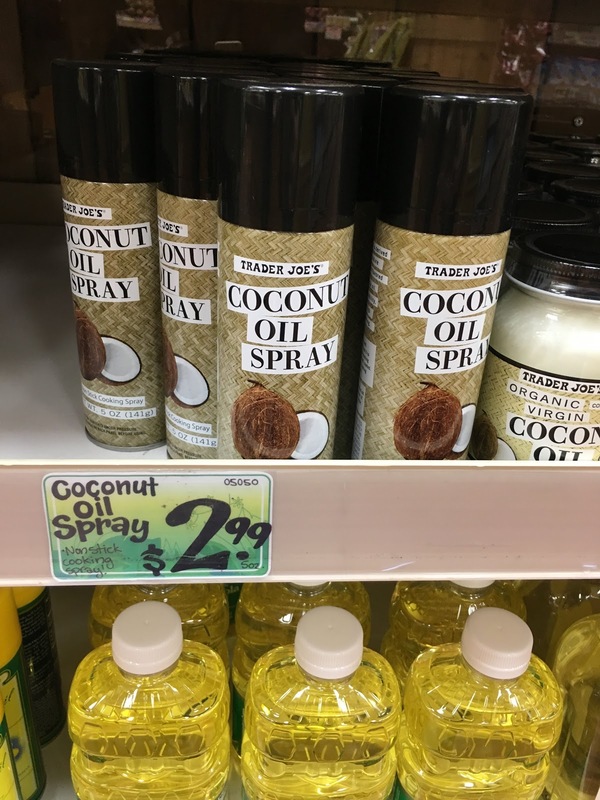 Coconut oil spray | I feel a little better using this than the mystery vegetable oil blend found in a can of Pam, and it's cheaper. Win-win. 10-minute farro | I love this stuff. It makes a great base for buddha bowls, or as a convenient way to bulk up a salad with a few more carbs and protein. Flavor-wise it's quite mild, but offers a subtle nutty chew, which I love. 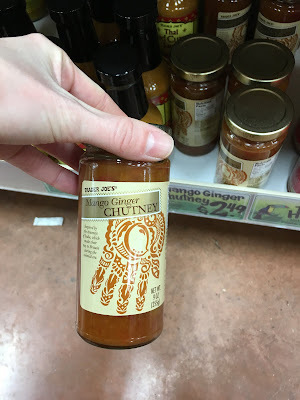 Mango ginger chutney | The flavor of this stuff is so good. However it's a little chunky for my taste so (don't judge) I actually dump the contents in my blender and then transfer it back to the jar when it's a little smoother. 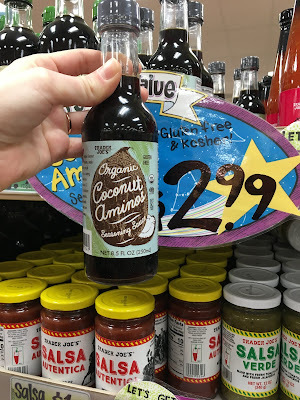 It's super tasty on chicken, or I use it to dip frozen Trader Joe's coconut shrimp in for a meal in a hurry. Their coconut shrimp narrowly got cut from my list, but you will always find a box in my freezer. 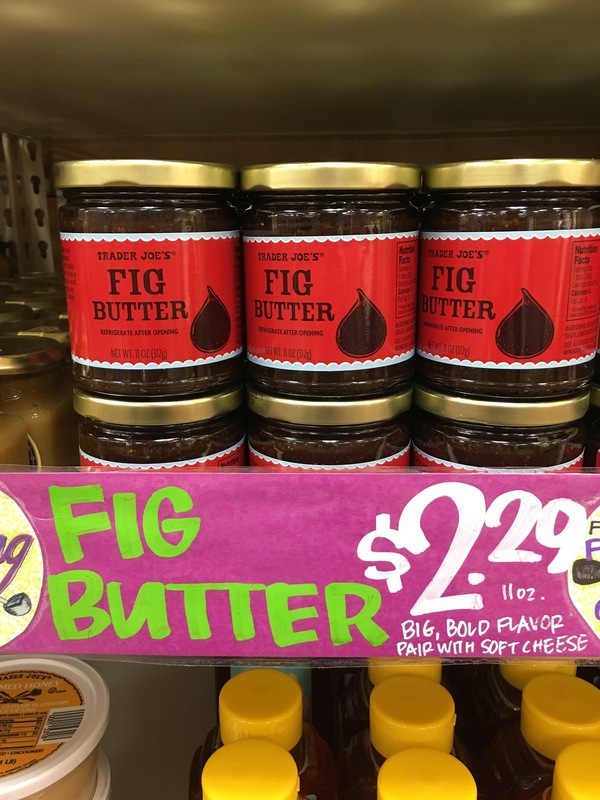 Fig butter | I smear this on flatbreads with proscuitto and blue cheese, or serve on crostini with goat cheese. Also good with apples. It's a bit thicker than apple butter in consistency, and the flavor is really pronounced. Highly recommend. 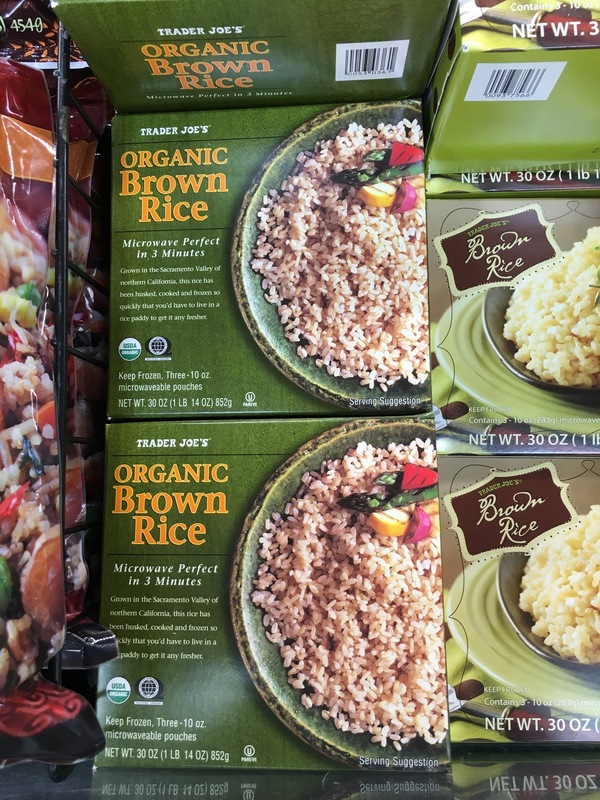 Frozen organic brown rice | Brown rice is such a pain to cook, so I keep these on hand to avoid it. 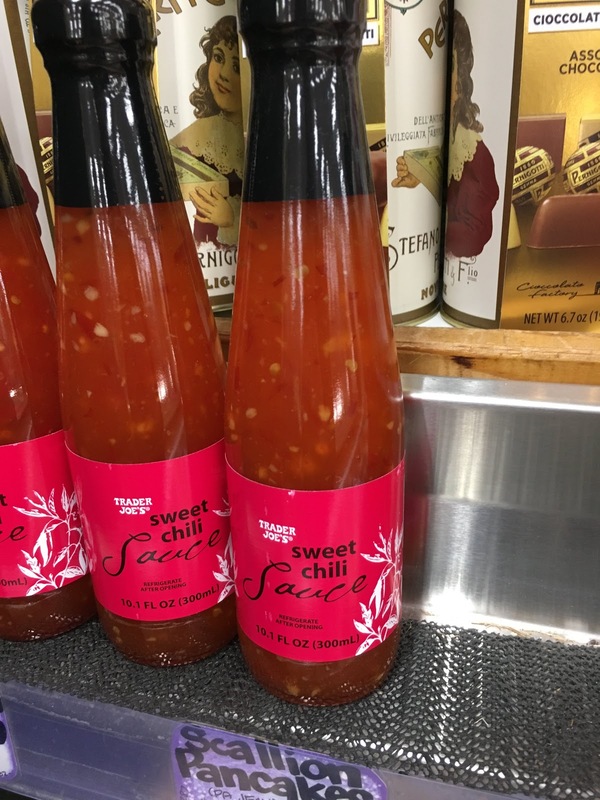 I mix it with lime juice, zest, and fresh cilantro to serve as the base of burrito bowls, or make a great spicy kimchi fried rice topped with a fried egg. Fire roasted red peppers | These are great in stews and soups, on paninis, in tuna salad, and more. 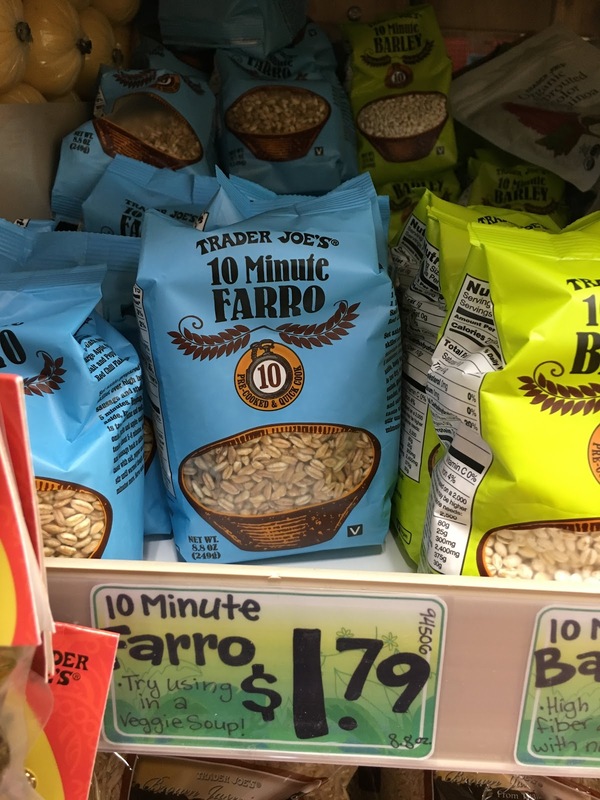 They're cheaper and have cleaner ingredients at Trader Joe's. 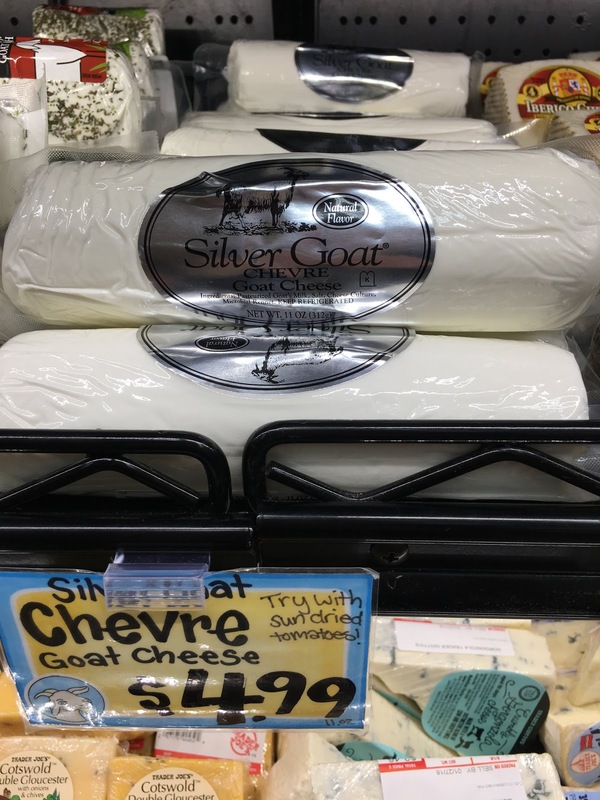 Goat cheese | I should probably buy stock in goats because 1) they're adorable and 2) I eat SO much goat cheese. 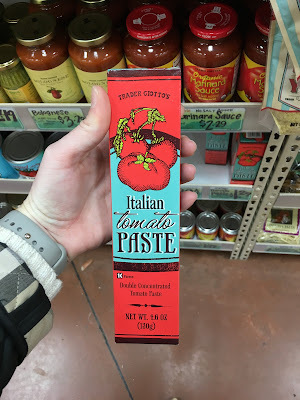 I use it on flatbread, to top roasted sweet potatoes, on salads, on bread... So I always have a log in my fridge and Trader Joe's price/quality combo can't be beat. 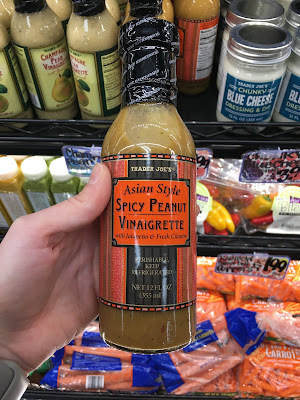 Spicy peanut vinaigrette | This stuff + a bag of organic broccoli slaw + crushed peanuts + dried cranberries is one of my fav easy meals. If I have the time/ingredients, I'll occasionally add cubed grilled chicken and whole wheat angel hair pasta. Might sounds strange, but it is SO good. This is also a super good dressing for lettuce wraps. Sweet potatoes | There's nothing outstanding about Trader Joe's sweet potatoes except how exceptionally cheap they are compared to my other grocers. I eat so many that I'm sure I've saved a ton. Pro tip- pierce it all over with a fork, wrap in a damp paper towel, and microwave on three minutes each side. Top with goat cheese or almond butter = easiest office meal ever that required zero preparation. 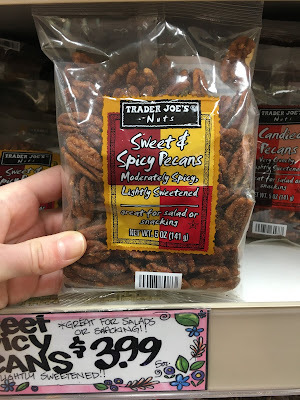 Sweet & spicy pecans | I could eat a whole bag as snacks, but I actually buy these for salad toppings. 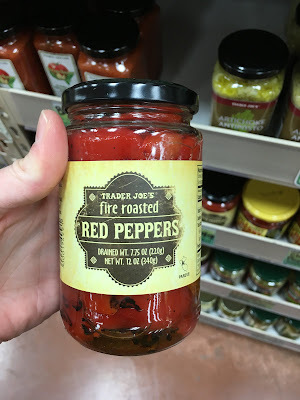 The balance between spicy and sweet is perfect, and like all of TJs nuts, they're such a good value. 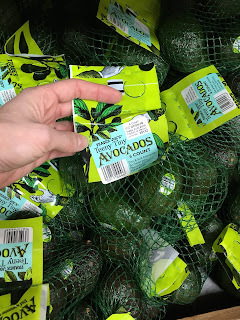 Teeny tiny avocados | I will literally make a separate trip to TJ for these avocados. They are small and I love them. One avocado is the perfect single serving to toss on a salad, make avocado toast, etc... so I love that there is no need to store the other half or eat brown avocado later. Bonus points for being super cute. 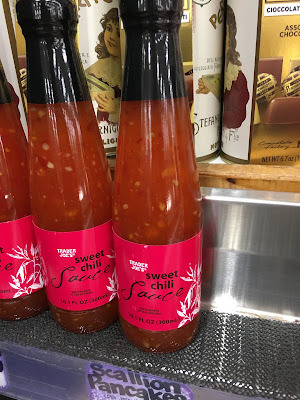 Sweet chili sauce | This stuff would make cardboard taste good. 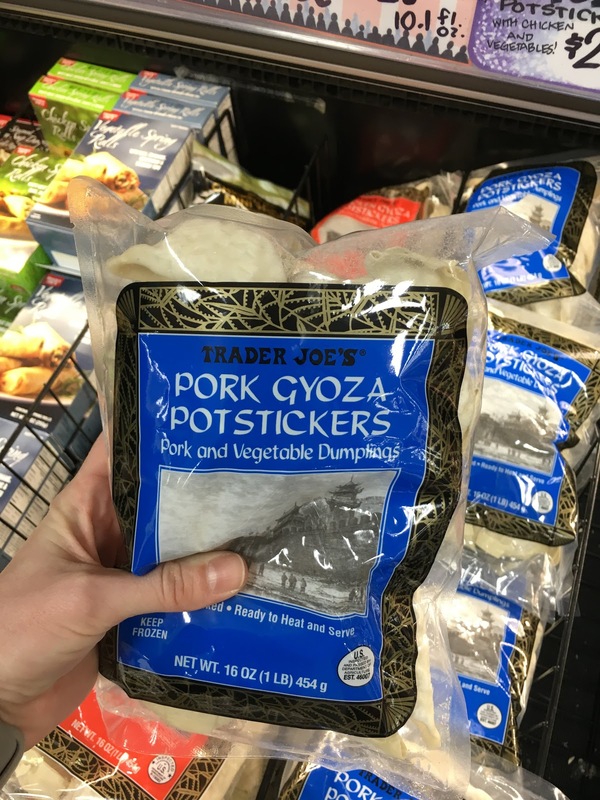 I buy it primarily to dip the soon-to-be-mentioned gyoza in, but I am actively seeking other reasons to eat it, so please chime in if you have any! Dorot chopped basil and garlic | I keep both of these stocked in my fridge always for stir fries, sauces, etc. I prefer fresh garlic, but this is just so easy, and I don't often keep fresh basil around. Whole milk Greek yogurt | Whole milk greek yogurt is really hard to find, and I generally just prefer my dairy products full-fat. 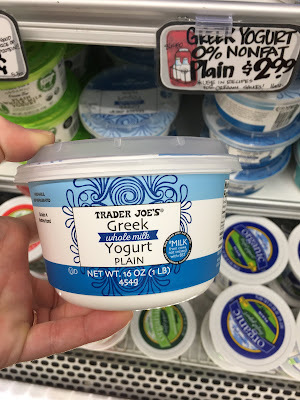 This makes a killer substitute for sour cream, I use it for homemade tzatziki, Greek yogurt caesar salad dressing (SO good), or to add protein to smoothies. 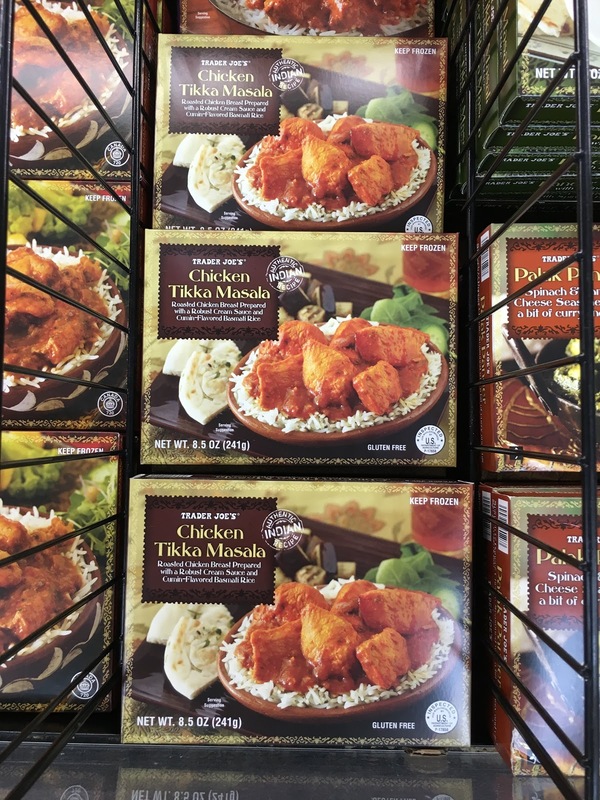 Frozen chicken tikka masala | I keep one of these in my work freezer at all times for emergency food. 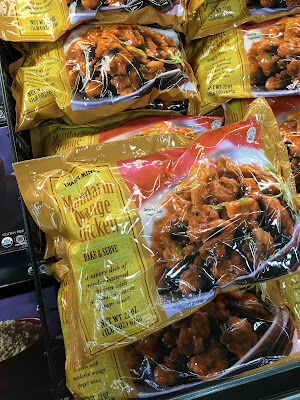 It's just a simple rice and chicken dish, but for 5 minutes in the microwave, it packs a nice flavor and protein punch. 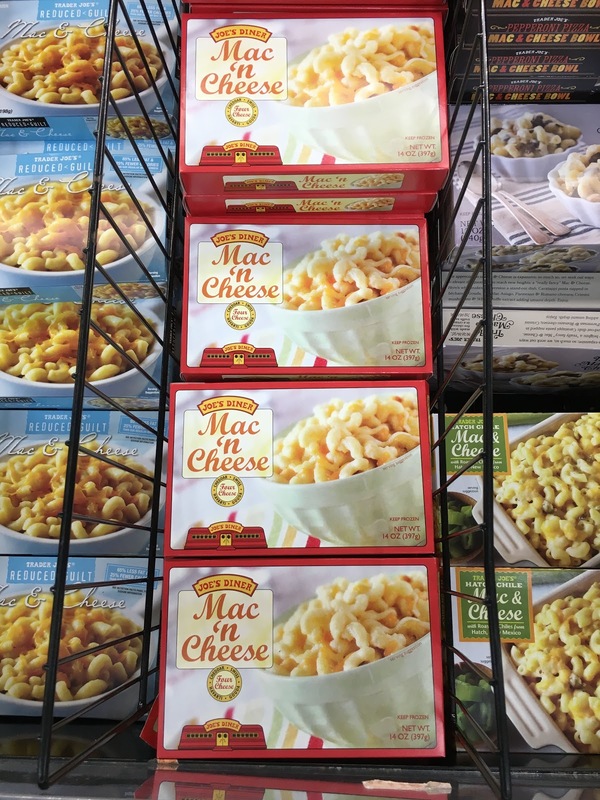 Frozen mac & cheese | I don't buy the mac & cheese on the regular, because it's quite glutinous, but man it's really, really delicious. It's super creamy and cheesy- it kind of reminds me of Noodles & Co mac & cheese, which is a very good thing. Pork gyoza potstickers | So maybe these aren't supposed to be a meal, but sometimes we whip up a batch and call it that. I highly recommend the stovetop cooking method- the bottoms crisp up beautifully and they are super tasty with the Sweet Chili Sauce I mentioned earlier. If you're feeling super lazy, I also recommend a batch of TJs frozen chicken fried rice. Pretty much the best 10 minute, $6 dinner ever. We eat it way too much. Mandarin Orange Chicken | Speaking of eating too frequently... this is another emergency freezer staple that we inevitably end up eating biweekly (every two weeks... btw). The sauce is super tasty and it crisps up wonderfully in the oven. Also great with the chicken fried rice. 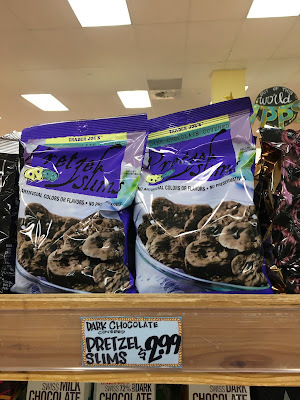 Dark chocolate covered pretzel slims | Dude, these are so good. I have a serious issue of craving sweet, then salty, then sweet, in a never-ending dangerous cycle. 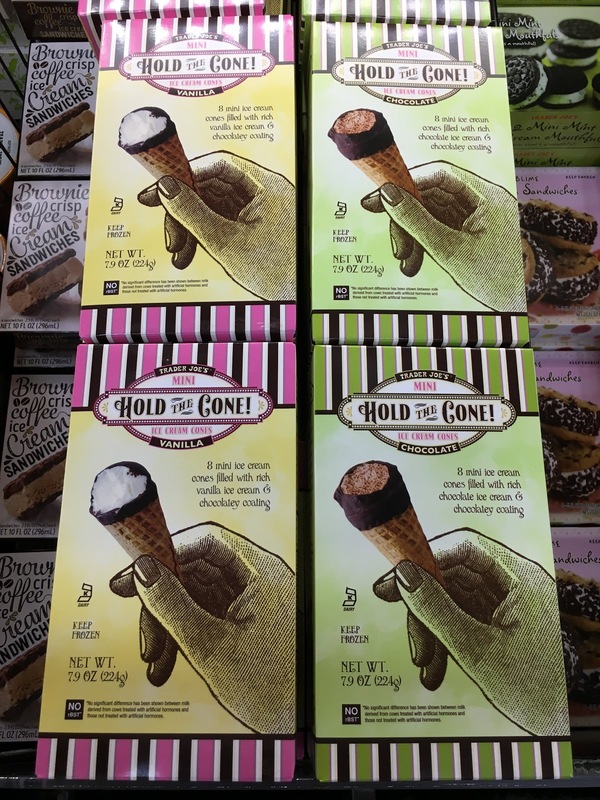 These delicious treats however quell it perfectly in just a few pieces. 5 stars. 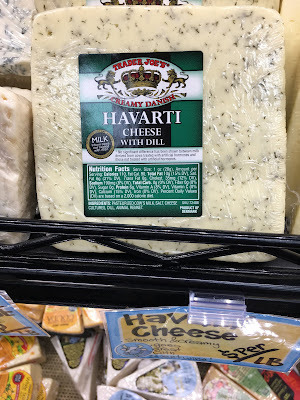 Dill Havarti cheese | I just really love dill. Other than just with crackers, I have no ingenious use for this cheese. I do love the color and variety it brings to a cheese platter too. 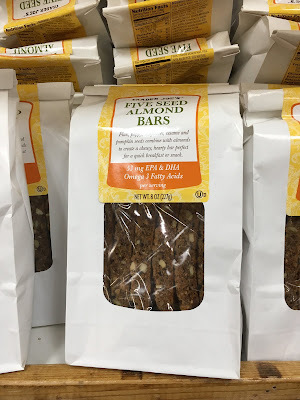 Five seed almond bars | So these are basically like a fancy granola bar, but tastier. I typically keep them in my desk drawer for breakfast. Also yummy crumbled over yogurt a la granola. Fruit jellies | Another item I only buy a couple times a year because: nowhere near healthy. 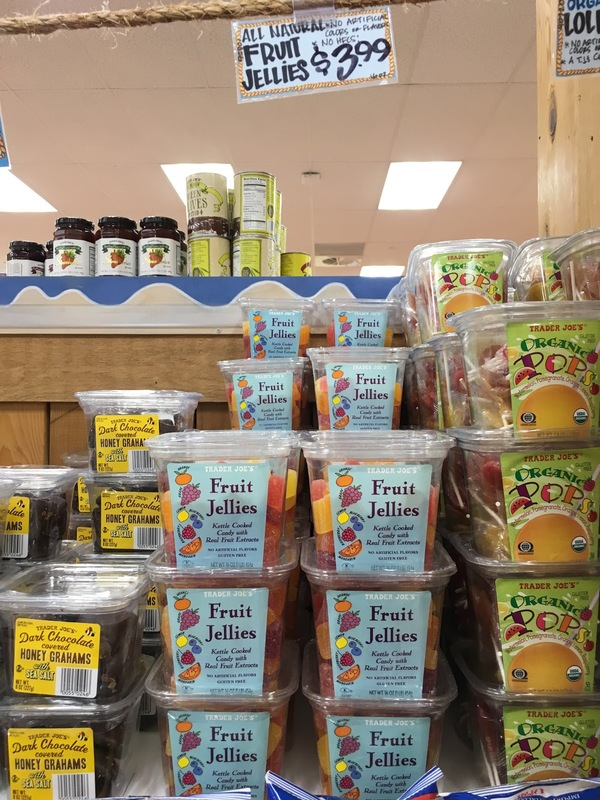 I love a good fruit jelly, and these come in all good flavors and are more accessible and cheaper than the fancy candy store variety. Mini drumsticks | So uh, since one mini drumstick is under 100 calories, I'm gonna call this a health food, k? Cool, we're on the same page there. 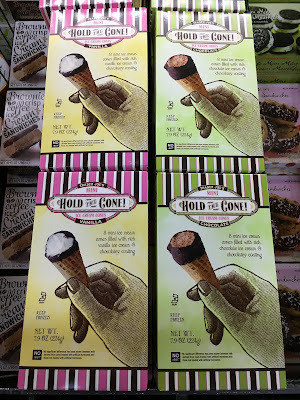 Waffle cones are up there in my list of favorite foods (no seriously, they don't even need to have ice cream in them) so I love this tiny dessert option that can strategically stay out of sight in the freezer. 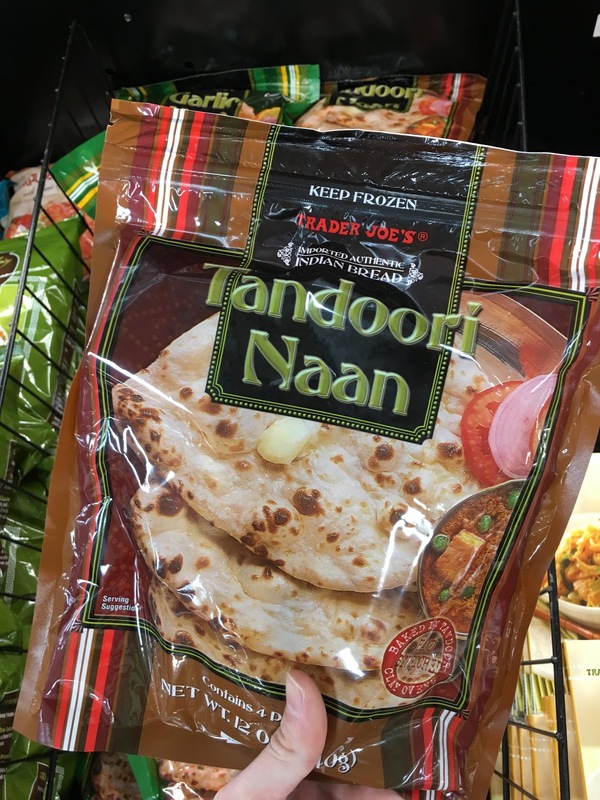 Tandoori naan | This stuff cooks up in like 2 minutes and is the perfect accompaniment to curry dishes. 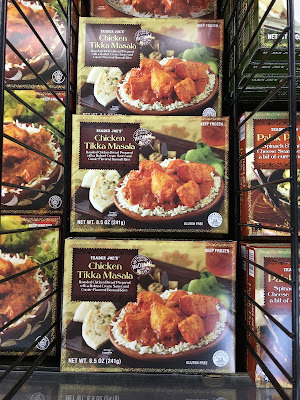 I also love to make chicken, cauliflower, and chickpea tikka masala with TJs tikka masala simmer sauce and sop up the extra sauce with this bread. Roasted plantain chips | These are like a more exotic tortilla chip. I love them with guacamole or crumbled over a burrito bowl. 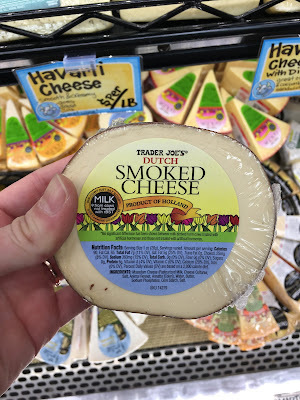 Smoked gouda | If you like smoked anything, buy this and pair it with crisp apple slices. SO good. Triple ginger snaps | I LOVE ginger so these are easily in my TJ top 5. I always have them on hand. If you wanna get real fancy, you can make little cookie sandwiches with cookie butter or chocolate fudge sauce in between, but frankly I don't know that they can be improved. They're mega gingery and have the perfect crispy texture. 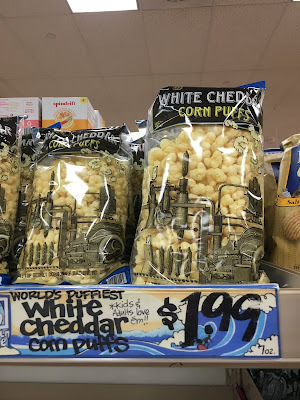 White cheddar corn puffs | In case it's not evident yet, I'll just call out that I love my snack foods. This one has the perfect light texture and subtle cheese flavor. Plus one serving is actually satisfying. Fire roasted corn (Frozen) | I love the extra flavor from being roasted- I add this to stews, soups, and chilis. 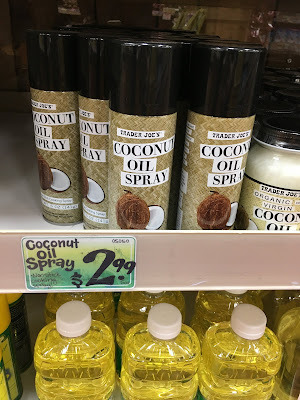 Canned coconut milk and cream | You can't beat the price at TJ. I use this in curries, Jamaican rice and peas, and clean desserts. Phew! Congrats for making it through that. Now, what are your favorites? Do we share any? Did I miss something wonderful that will complete my life?! Please do share! This is such a great roundup, I love so many of these as well. Best TJ's round ever! I love their cauliflower rice too and keep several bags in the freezer at all times. (have you tried the frozen cauliflower pizza crust? It's good too) Love the Faro and the barley is good too. 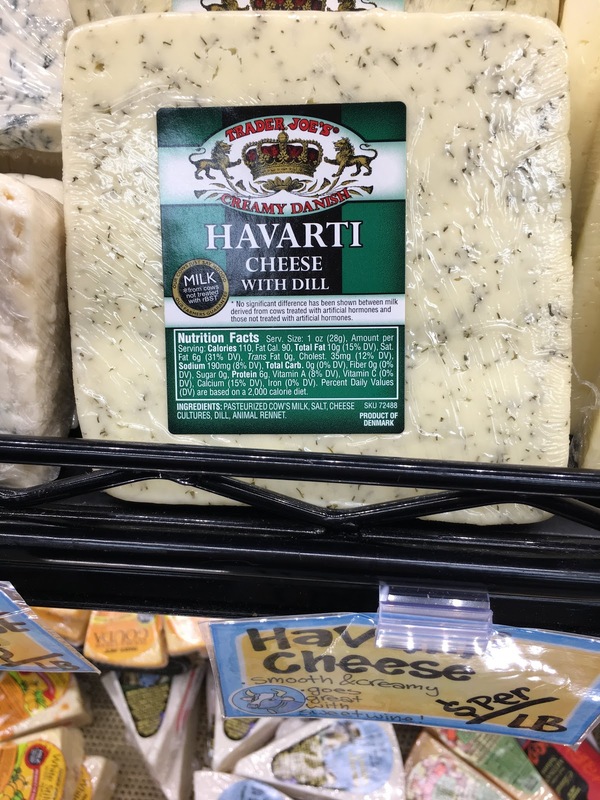 They have the best crumbled gorgonzola if you haven't tried it. 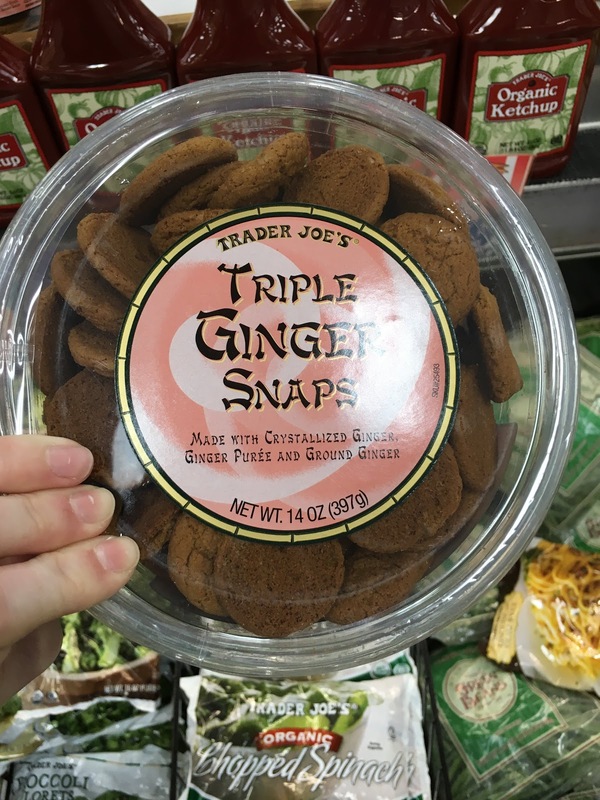 We love their ginger snaps too. I definitely plan to take this list next time I go and for sure get the Coconut aminos and a few other things. Great job. Thanks!!! Many of these are on my favorites list too! But I must add (to the not so healthy list) their chocolate croissants. To. Die. For. And also their French butter. So much better than American butter. 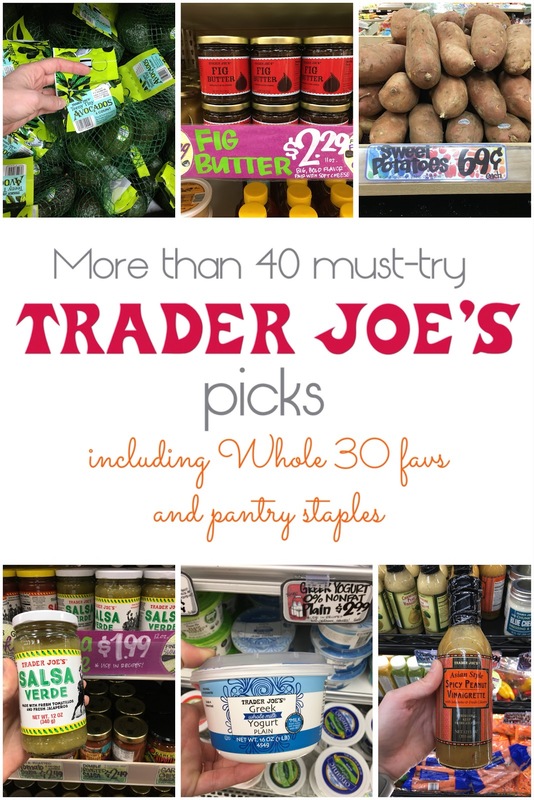 If you haven't tried either definitely do- when Whole30 ends,of course!